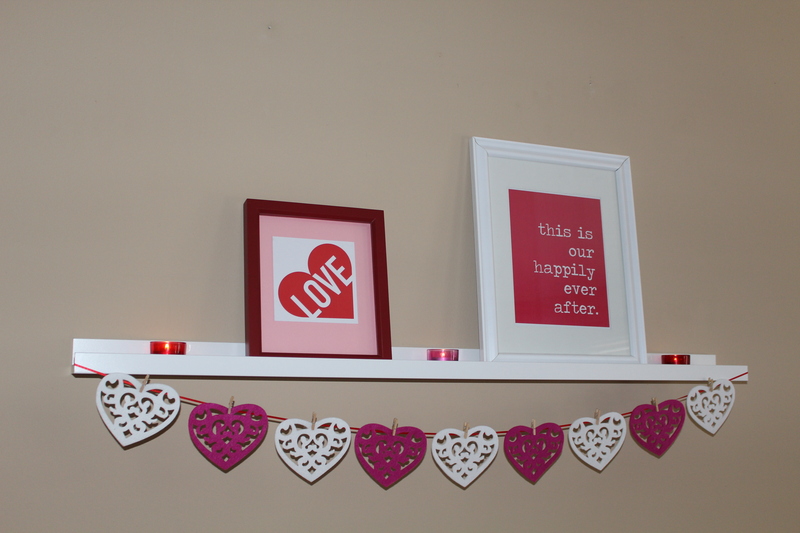 I finally got my Valentine’s Day decor up. There’s not much of it, so it was really just laziness that it took me so long. 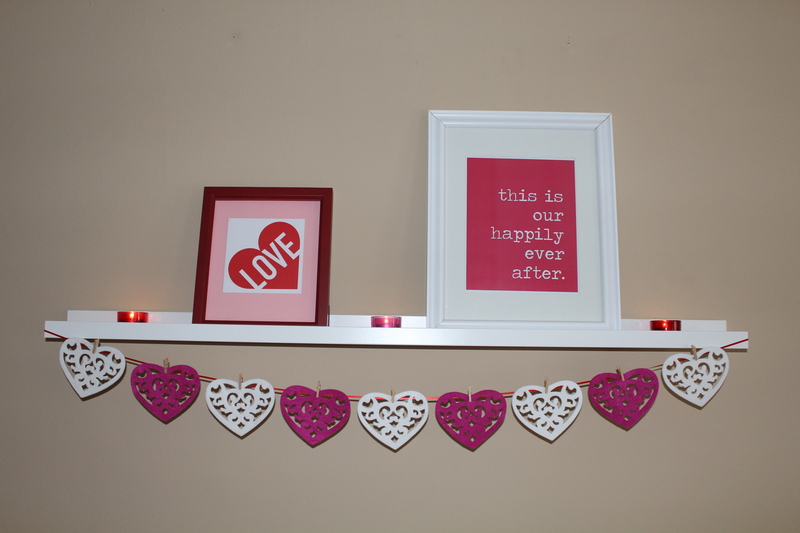 Last year, I showed you the heart garland and heart pillow that I made. Those have been put to use again. 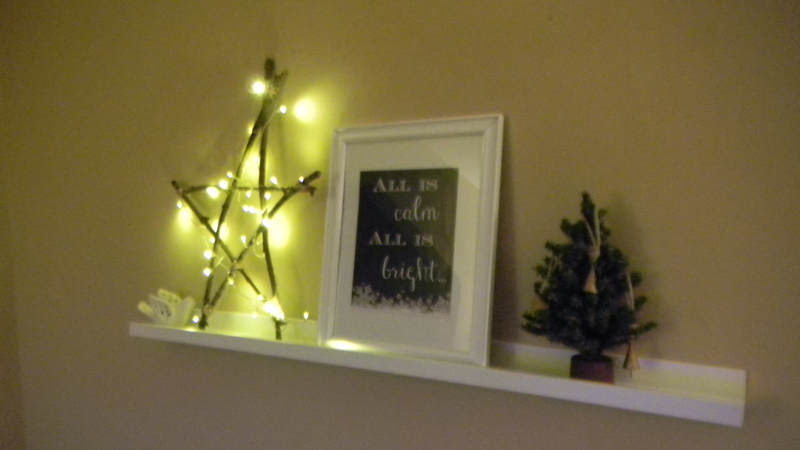 The main upgrade for this year was the mantel I decorated in our living room. It’s the first thing you notice when you walk into the apartment, so I like to keep it festive and change the decor out each season/holiday. The wall art in the frames were easy to do. 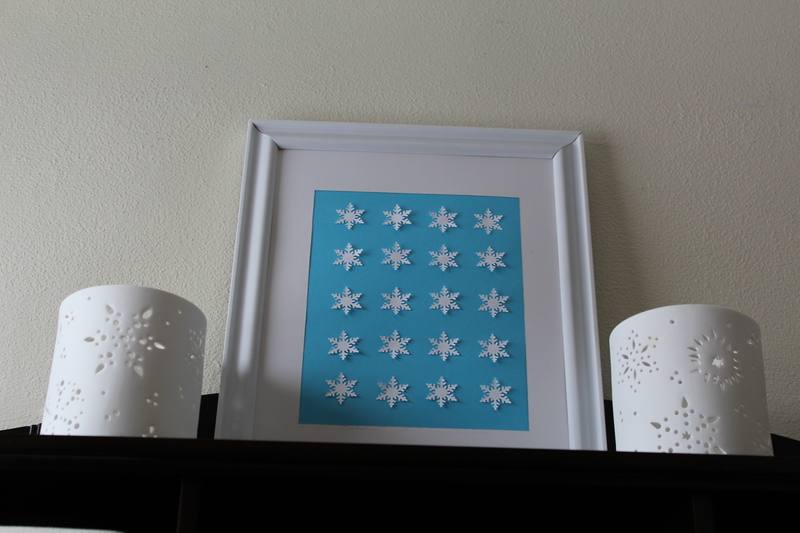 I printed out this printable from Scrapaholics. For the red frame, I found a Valentine’s Day card I had given Dan last year, centered it in the frame, then backed it with pink scrapbook paper. Those little tea light holders are from Ikea, though I bought them years ago and doubt they are still available. 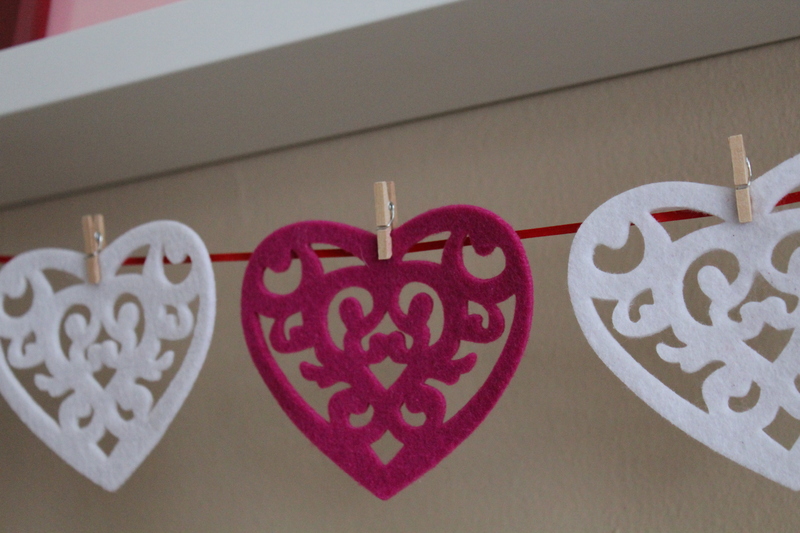 I still had some of those felt cut out hearts from last year laying around, so I used some leftover red ribbon (from Christmas) and some mini laundry pins to hang them. Pretty simple, but I really like the way it looks. 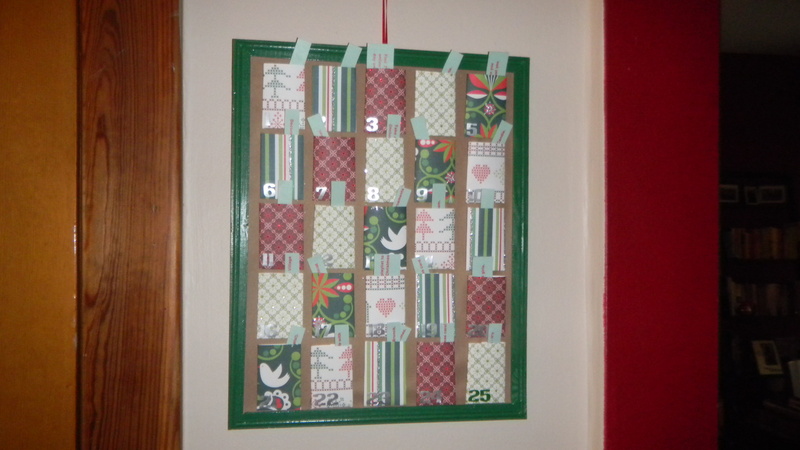 Remember this Advent Calendar that I made last year? Well, I pulled it out of the Christmas decoration box and put it right up on the wall. 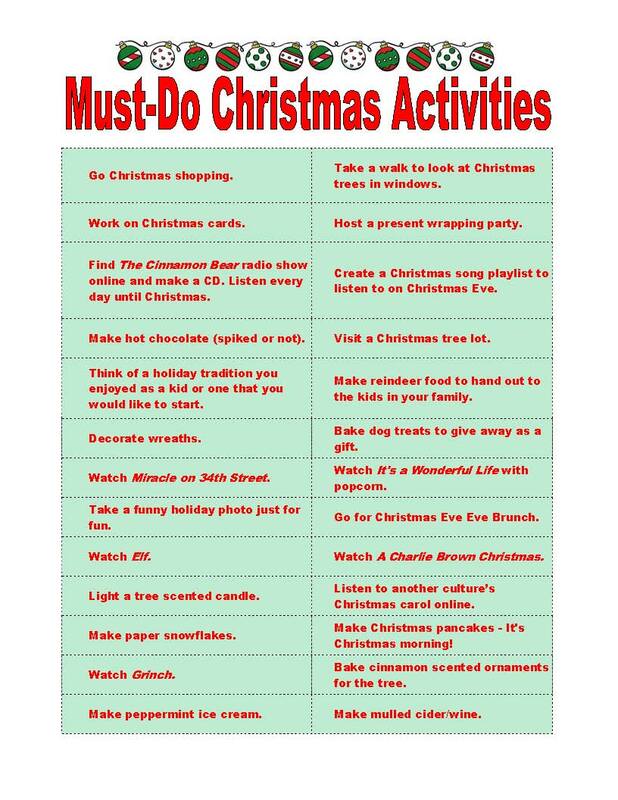 I’ve been coming up with Christmas activities for us to do over the last few weeks, and I made a printable, cut out list. I decided this would be easier than making tags again. Just print, cut, and you’re done. All I needed was the calendar itself to get the days of merriment rolling. 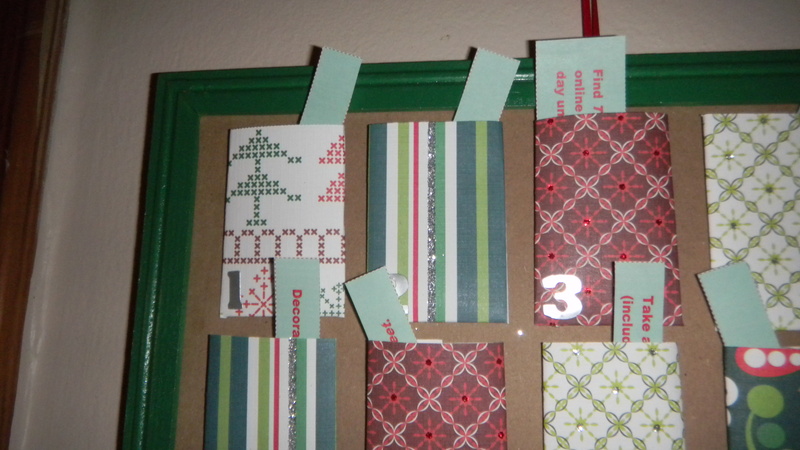 The Advent calendar starts on December 1, so I’m ready to go for whatever Christmas fun is lined up for tomorrow. Happy almost December! 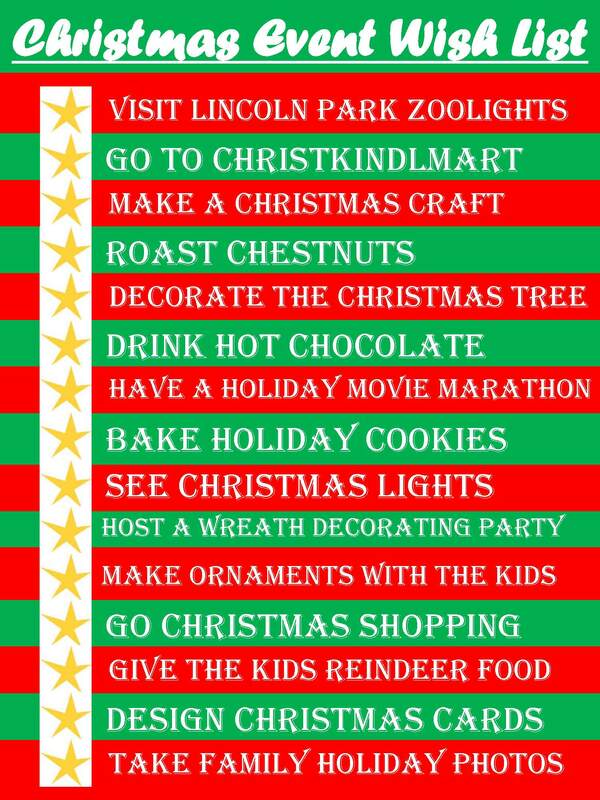 I can’t wait for the season of Christmas lights, hot chocolate, family, and friends to begin! As I mentioned on Monday, we decorate for the holidays on the day after Thanksgiving. While watching Elf. I love how homey and peaceful the apartment feels with the glowing lights of the Christmas tree, so I always want the tree and decor up as soon as possible. That works fine for the stuff we put out every year, but not for all the wonderful Christmas crafts I always intend to make, then run out of time. Not this year. 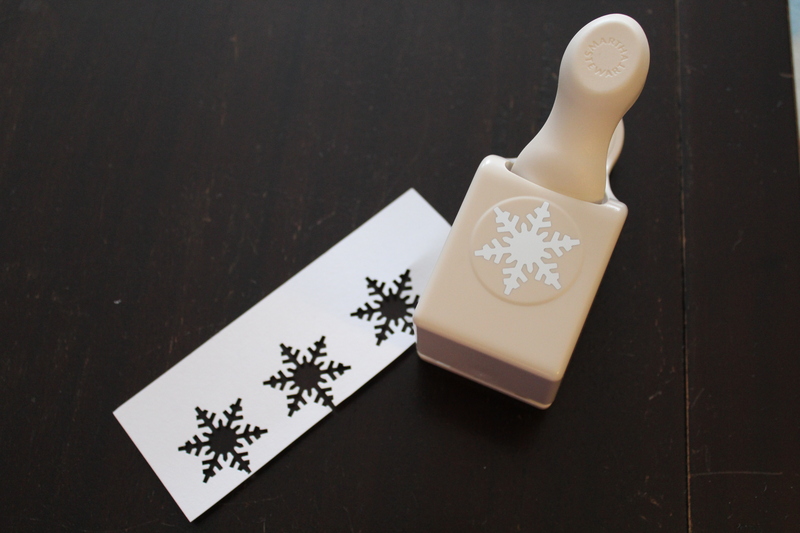 I picked out just a few crafts to make, so I wouldn’t overwhelm myself in trying to make a winter wonderland in my living room. 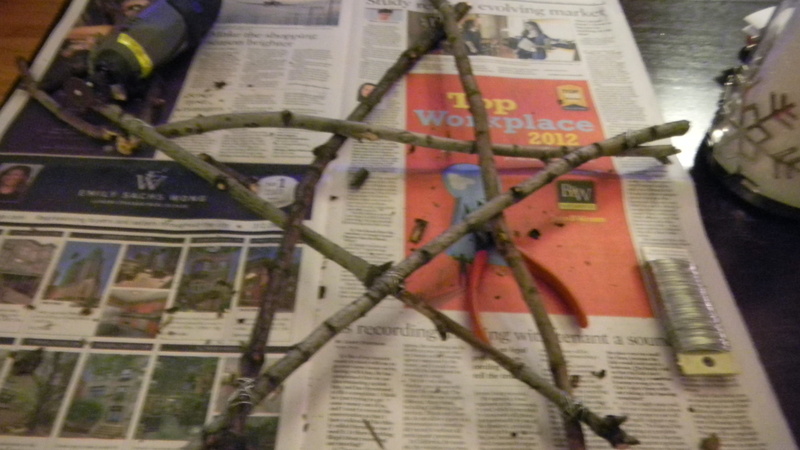 One of the first items on my list to make was this natural wooden star, which I think turned out quite well. 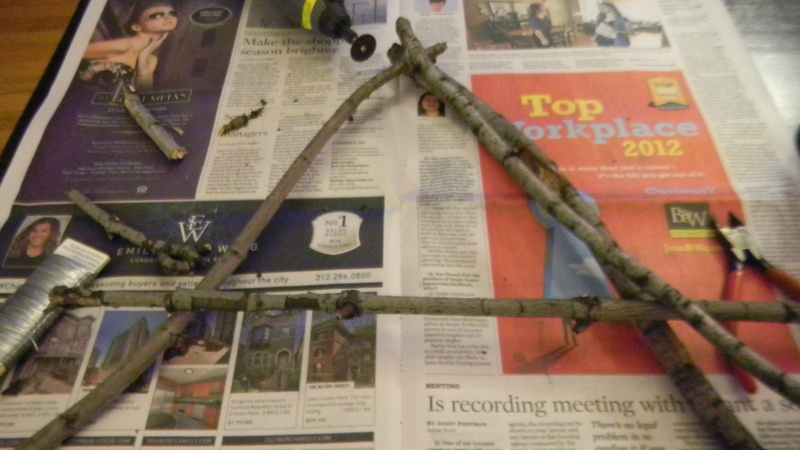 Making it only took about half an hour, once I gathered up all the sticks from outside. It wasn’t super easy finding suitable sticks while walking down local streets in Chicago, but I made do with what was there. 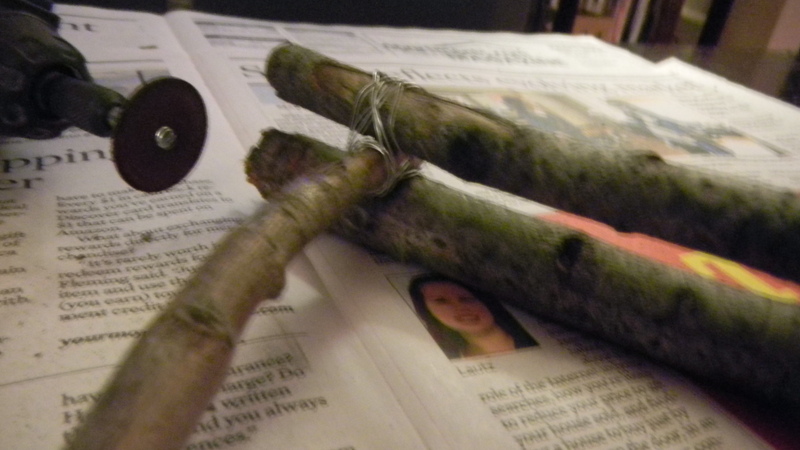 To keep the sticks together, Dan drilled little holes in the sticks and used thin wire. I didn’t like how the wire looked, so I took some red, white, and green yarn and wrapped it around the wire for a bit of whimsy. I wanted it to light up, so I strung mini battery powered LCD lights through the branches. 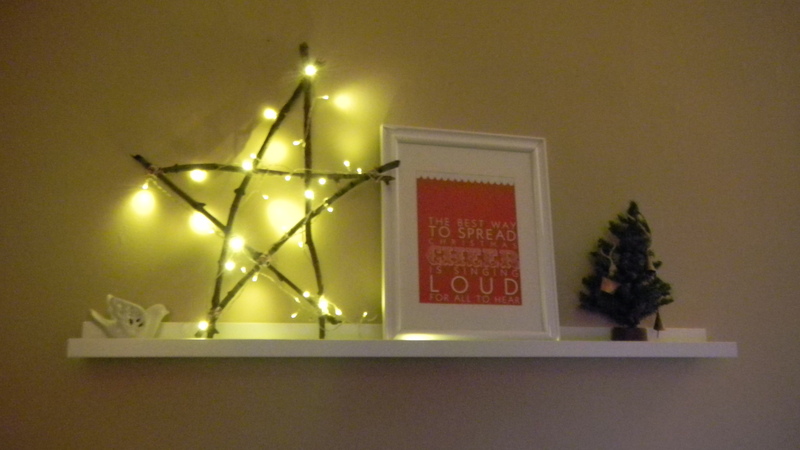 I knew the perfect place to put the star – on the shelf behind our couch. It’s the first thing you see when you walk in. The star looked lonely up there buy itself, so I added a mini Christmas tree with old looking bells, a sparkly white dove, and a framed Christmas saying. First, I had the famous Elf quote: “The best way to spread Christmas cheer is singing loud for all to hear.” See above. But, as much as it made me smile every time I saw it, the print didn’t really go with the more natural, toned down elements in the room that I wanted. 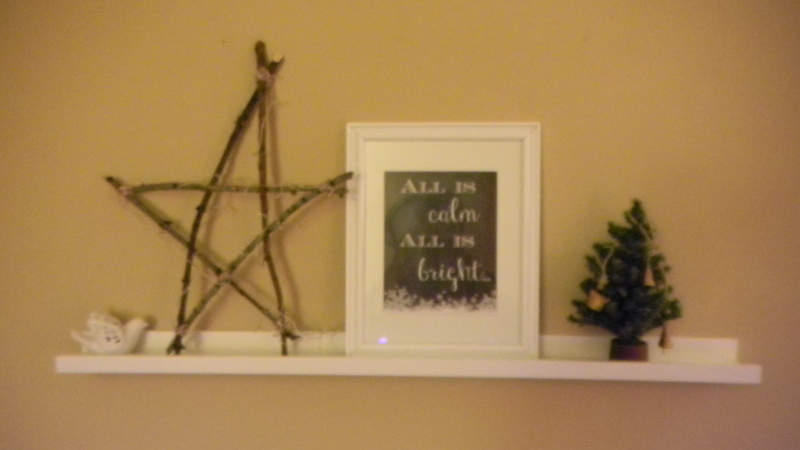 Out went the Elf print and in went this wonderful chalkboard printable that I got from here. Yes, I jumped on the chalkboard bandwagon. I love the look. 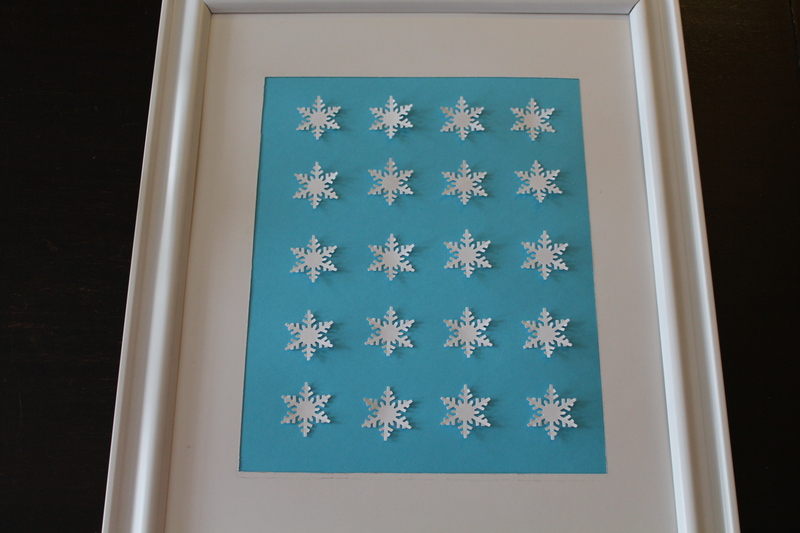 Christmas craft project #1 this season…SUCCESS! Over the summer, Dan and I checked out Lit Fest, down in Printer’s Row. It was cool to see some seriously old books, meet some authors, and just generally be downtown in the city on a nice (hot) day. 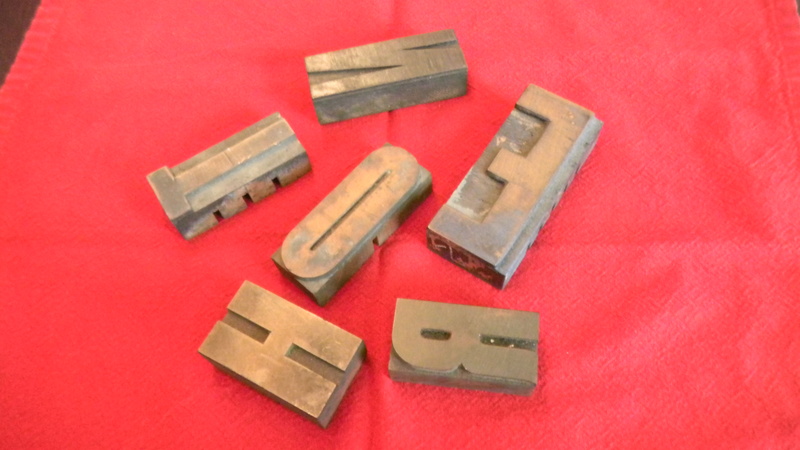 We ended up buying some bestseller paperbacks to help a local school, and some old letterpress letters. Looking through them made your fingers all inky, but it was really neat seeing all the different fonts, symbols, and styles. I just had to have some. 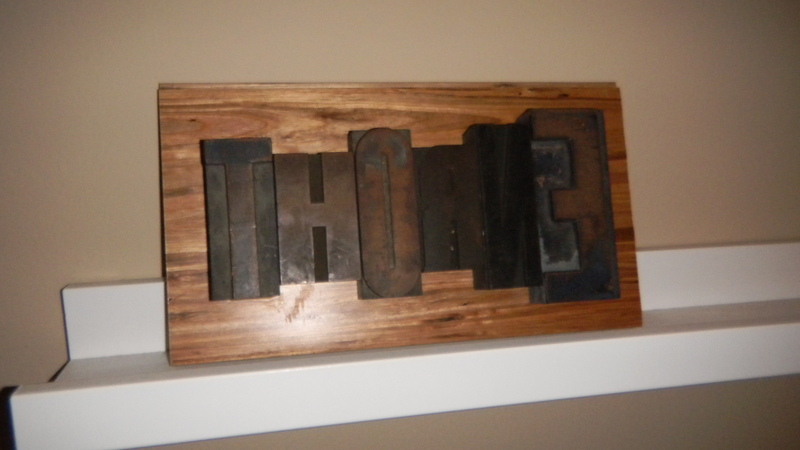 We ended up buying the letters for our last name: THORNE. As this was a popular booth, they didn’t have all the letters we needed in any one specific font or size. Turns out, the variety made this project turned out much better anyways. At first, I wasn’t quite sure what to do with them. Put them in a cool jar? But then you wouldn’t be able to see what the letters spelled. 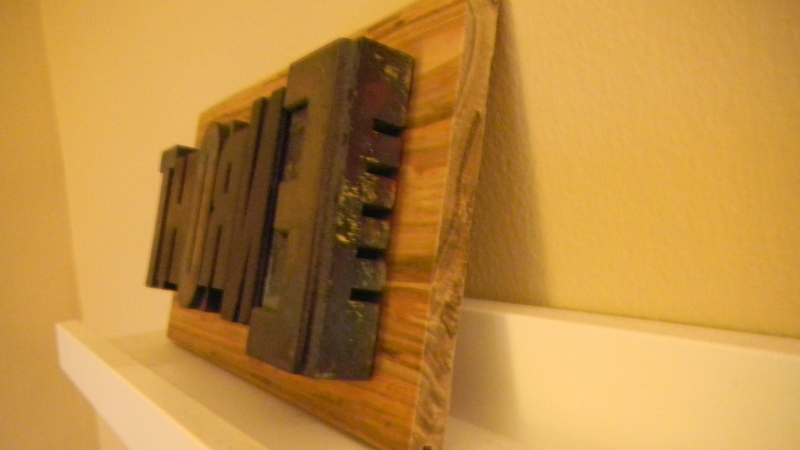 I finally figured it out and decided to mount the letters on some wood, and use it as a sort of sign to display. My original thought was to use a couple pieces of distressed pallet wood, but as I thought about it, I didn’t love the idea. 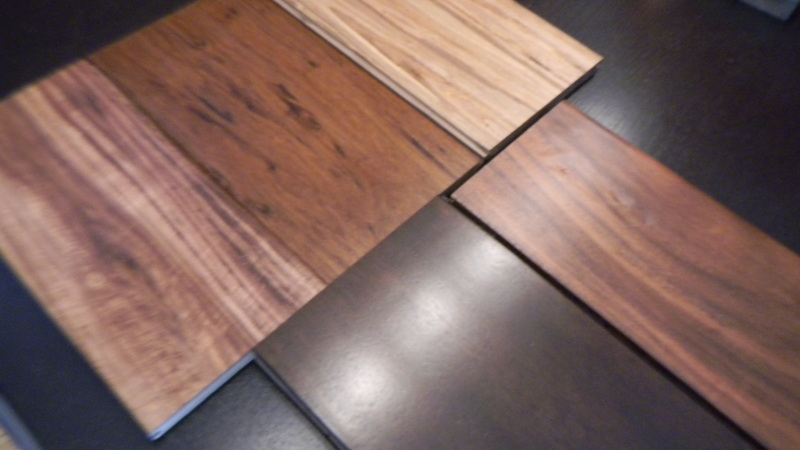 I ended up deciding to use…get this…a hardwood floor sample. Uh huh. I picked up a bunch of samples, put the letters next to them, and picked the one that worked best with the colors in the letterpress stamps. Once that was decided it was quite an easy project. 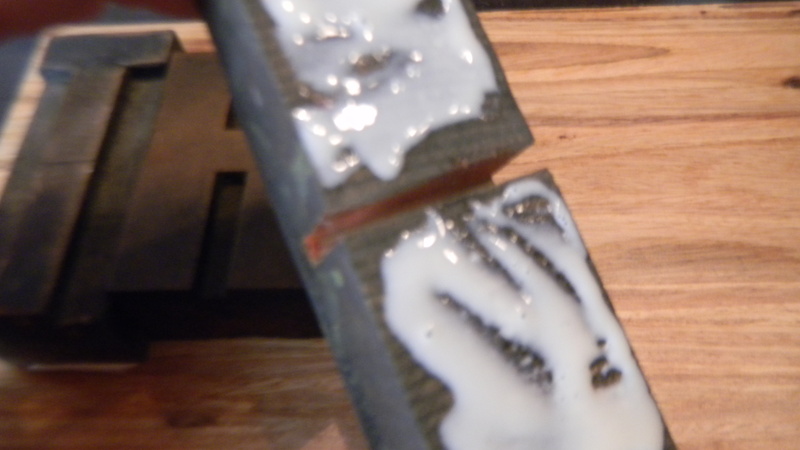 I just took some wood glue and, after having spaced out the letters the way I wanted them, I glued them in place. I put a couple heavy books on top of the letters while they dried overnight. Now, this cute little piece sits on the shelf behind the couch in our living room. 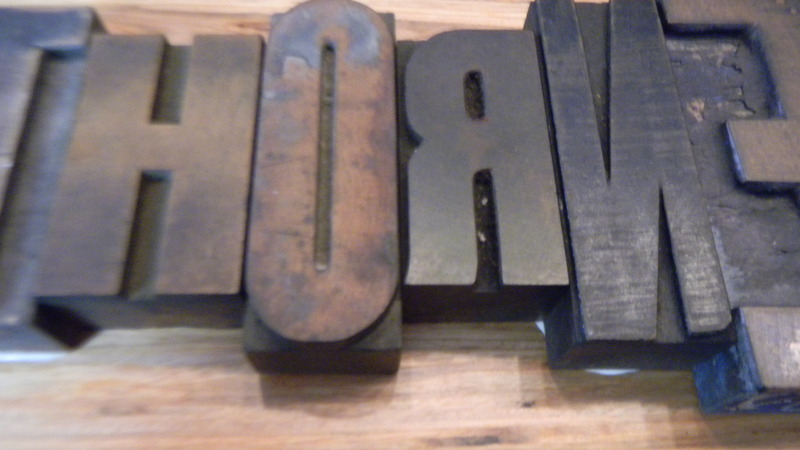 And look, from the side, you can see the grooves where the letters fit into the letterpress machine. This guy will probably find a new home elsewhere in the apartment, but for now, I like seeing it when I walk in the front door. Not that I’ve officially properly mourned the end of summer, and shared my fun warm weather happenings, I’m ready to move on to fall. 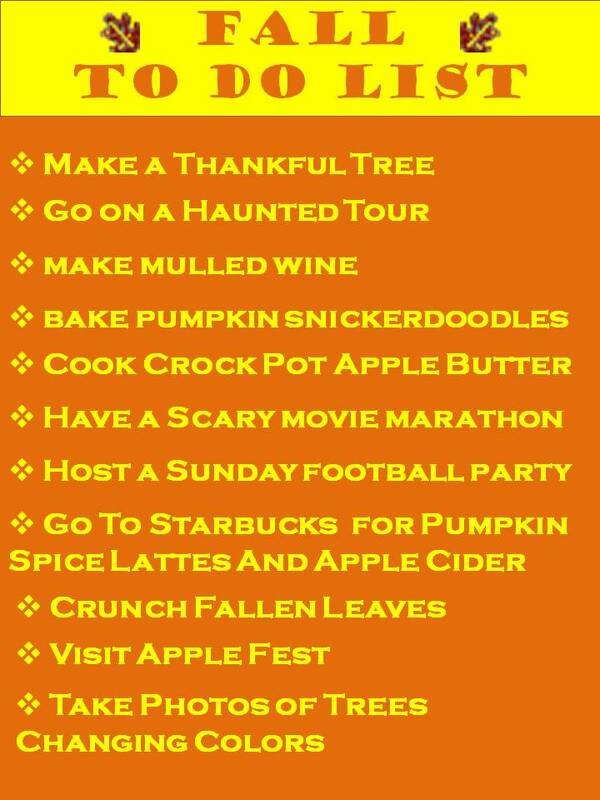 Last year, I created this Fall Fun Checklist. I never really updated my progress on it, but I can tell you now that I completed everything except visiting a haunted house and playing in leaves. Pretty good in my book. This year, I’ve created a new to do list, and tried to come up with completely new activities to try. As you can see, I made a few tweaks to the layout. I kept the general color scheme the same, it is fall, but I inverted the list to be vertical. I think it looks better on my mantle that way. I really had to limit myself in the food category. What it is about crisp weather that makes you want to bake up a batch of fatty cookies or whip up a pot of creamy, calorie-filled soup? I do have a ton of new fall recipes I want to try, and I’m sure you’ll hear about those when I get around to making them. 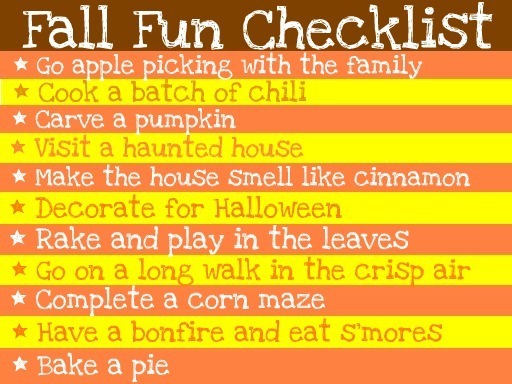 Feel free to print out mthe checklist and partake in my fall fun. I hope to check just as many off my list as I did last year. Are there any activities you’re looking forward to this season that I’ve forgotten?